Chuncheon (Hangul: 춘천; Hanja: 春川市; Korean pronunciation: [tɕʰun.tɕʰʌn]; formerly romanized as Chunchŏn; literally spring river) is the capital of Gangwon Province in South Korea. The city lies in the north of the county, located in a basin formed by the Soyang River and Han River. There are some large lakes around the city, most notably Lake Soyang and Lake Uiam (or Dam Uiam). The area is renowned for its small river islands, such as Sangjungdo, Ha-Jungdo, Bungeodo and Wido. It is a popular destination among east Asian tourists as it was featured in the popular Korean drama Winter Sonata (겨울연가). It is where the resort island of Namiseom is located. The area now occupied by the city was first settled about 1000 years ago. In 637 AD the city was called Usooju. In 757 AD it was renamed Saku and again in 940 AD as Chunju (춘주; 春州) before receiving its current name in 1413. In 1896, Chuncheon became the capital city of Gangwon province. The city was largely destroyed during the Korean War during the Battle of Chuncheon. According to the legend surrounding Cheongpyeongsa temple in Chuncheon-si, a man loved a princess so much that he became a snake and would not leave her alone. When she begged leave to collect rice from the temple, the snake let her go but then went looking for her, only to be struck dead by lightning. The princess then buried him at the temple. The city was historically known as a chicken farming region, and is famous for "dak galbi", which translates as chicken ribs. It consists of chicken, sliced cabbage, sweet potatoes, tteok (rice cakes), and scallions, mixed with a spicy sauce heavy on gochujang. It is usually cooked in a big iron pan in the center of the table, but the original method is over charcoal. Despite the name, the dish is traditionally made from leg meat, not ribs. There is even a street in the city dedicated to restaurants serving the dish, with some 25 restaurants populating the area. Also, Makguksu noodle is famous among the nation. Chuncheon city tour bus runs on April to November. The bus offers different course through Monday to Sunday. If you use city tour bus, they offer some discount admission fee. The following table is about transition of population per five year. 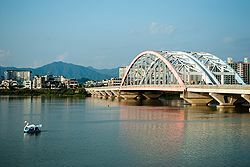 Chuncheon is the northern terminus of the publicly funded Jungang Expressway, and the main destination of the privately run Seoul-Chuncheon Expressway, as also known as Gyeongchun Expressway that connects to Seoul and Hongcheon-east. As of 2017, the expressway has been extended to east coast city of Yangyang, thus renamed to Seoul-Yangyang Expressway. Chuncheon Bus Terminal connects to all major cities in mainland South Korea. Chuncheon has cold winters and hot summers. The lowest measured temperature was −27.9 °C (−18 °F) (February 6, 1969), and the highest was 39.5 °C (103 °F) (Aug 1, 2018). The annual precipitation is an average of 1347.3 mm. High1 (Korean: 하이원) is a professional ice hockey team which is based in Chuncheon. The club is a member of the Asia League Ice Hockey, which is played among South Korean, Japanese, and Russian teams. High1 was formed in 2004 and plays its home matches at the Goyang Ice Rink in Goyang. Chuncheon's association football club, Chuncheon FC, is a member of the K3 League, an amateur football competition and the fourth tier of the South Korean football league system. The club was founded on 27 February 2010 with its home at the Chuncheon Stadium. ^ "GimC:Gangwon Information & Multimedia Coporation". gimc.or.kr. ^ 춘천호반마라톤대회, 2018 함기용 세계제패기념 제15회. 2018 함기용 세계제패기념 제15회 춘천호반마라톤대회. hoban.wizrun.com. ^ "Legoland to break ground in Korea". Korea Herald. Retrieved 16 April 2017. ^ "Population and housing census". ^ 평년값자료(1981–2010), 춘천(101) (in Korean). Korea Meteorological Administration. Retrieved 7 December 2016. ^ 기후자료 극값(최대값) 전체년도 일최고기온 (℃) 최고순위, 춘천(101) (in Korean). Korea Meteorological Administration. Retrieved 1 August 2018. ^ 기후자료 극값(최대값) 전체년도 일최저기온 (℃) 최고순위, 춘천(101) (in Korean). Korea Meteorological Administration. Retrieved 1 August 2018. ^ 冬ソナ・春川市も交流中断 姉妹関係の各務原市などと) (in Japanese). Kyodo News. 2005-03-18. Wikimedia Commons has media related to Chuncheon.